It’s showdown time between Flash and Zoom this week as we get into the home stretch. There’s only five episodes left this season. We also see the Flash side of the Supergirl tie-in. Spoilers ahoy! We start with a flashback. We see Barry’s story, which we know. Of his witnessing his mother dying and being taken in by the West family. Then we jump to Earth-2 to realize that Barry isn’t the only one who suffered through childhood trauma. Jay’s father is apparently a veteran of some sort, with anger management issues. He beats up his wife, before pulling out a gun and killing her. Jay, who at the moment is known as Hunter Zolomon, is then taken to an orphanage. Barry is testing out the tachyon device that he got from Eobard Thawne in his jaunt to the past. He’s actually enjoying using his powers, and the team is monitoring his activities at the base. Barry continues racing through town, and if you pay attention you can see where his streak of lightning jumps a little bit. He returns to STAR Labs, asking how long he was gone, likely this was when he went to visit Supergirl, but they didn’t even notice he disappeared, and Barry never brings it up. Flash is now able to go four times as fast, putting him at the same speed as Zoom. Barry doesn’t like how bulky the device is though, and asks Wells if he can make it smaller. The other problem they are facing though, is that they don’t have a way to reopen the breaches. The one who likely would be able to is Wells, but he doesn’t want to help, for fear that Zoom could hurt them all again. After dinner, Barry fills Joe in on what’s happening and Joe says he sides with Wells on team not returning to Earth-2. Barry gives the same arguments, that he’s faster now, that they can’t leave that whole world at Zoom’s mercy, etc. Then Wally arrives, with laundry in tow. They have a brief conversation about Wally not living on campus anymore because it got to be too expensive. Joe says he wants to help, either financially or by giving Wally his old mini-fridge, but he declines the offers. When Joe asks about if Wally’s doppelganger is just as complicated, it gives Barry an idea. The team regroups at STAR labs, and Barry asks Wells about what he knows about Reverb’s powers. He tells him what he knows, and then Barry adds what they saw him do when they were over there. He has the power to sense other dimensions which is how he was able to find the breachers, and ability to manipulate multidimensional energies. Barry thinks that Cisco, who has the same powers, can do it as well. That is how they can return to Earth-2, by Cisco using those powers to open the next breach. Cisco returns to where the breach was in the basement of STAR labs where the breach was, and tries to focus his powers. Cisco doubts his abilities though, and it was unsuccessful. Wells goes to pay Joe a visit. Apparently he asked Joe to try and find Jesse, but he has been unsuccessful so far. Wells also asks Joe to talk to Barry about opening the breaches. Joe says that he agrees with Wells, but there’s no way anyone can talk Barry out of it. Joe then asks Wells to go with him, and help him, because it will give Barry a better chance of success. Barry then uses a device to find a place with energy from the breaches left over. Cisco tries again, and fails. Wells then arrives, this time on board, and gives Cisco a recalibrated set of goggles that should aid him in focusing his powers. Now with these helping him, he’s able to tap into the energy and open a breach. On Earth-2 Zoom senses the breach and rushes to where it opens up. Cisco then freaks out about something, and says he can’t do it. In addition to Cisco’s goggles, Wells also was working on the device used to steal Barry’s speed so that it can give him more speed. Joe and Iris arrive to help, but in turn need help from the others. Joe pulls Barry aside and asks for advice on connecting with Wally. He wants to help, but Wally doesn’t seem to want it. Barry says he’s offering the wrong kind of help. Instead of offering to pay for his room and board at school, he should have just offered him a room at their place. Joe is uncertain at first, but realizes it would be a good solution. Iris, on the other hand, goes to the med bay to help Caitlin with something. She confides in her that she was unable to go on her date the previous night, which would have been her first date since Eddie died. Caitlin asks if it’s because of Eddie, or Barry? Iris states that it does seem to be like they’re meant to be, based on Earth-2 and the newspaper clippings from the future. Wally heads to the West house and finds Joe clearing out a room. He lays down the traditional ground rules, no beer, clean up after yourself, but Wally smiles and calls him dad for the first time. Barry ties to connect to Cisco about what’s going on with him. He thinks that somehow Zoom was getting into his head. Cisco tells him it’s just himself getting in his own way. He compares himself to Anakin Skywalker, who is strong with the force, but tempted by the dark side. He doesn’t want to use his power and have it corrupt him. Barry tells him he was always terrified when he learned a new ability. He says that Cisco was always there for him when he went through all that, and he, and the rest of the team, would be there for him too. He has something Reverb never did, the team who is more than just friends, they’re family. Wells fixes the tachyon device so that its small enough to fit under his logo. Barry notices Caitlin is uneasy, and tries to comfort her. She makes a comment about Jay or “whatever his name is.” When Barry asks about it, she tells him that when she was looking for his doppelganger she found Hunter Zolomon. Wells hears this, and asks if that was really the name she found. He tells about how on Earth-2 Hunter Zolomon was a convicted serial killer, which are rarer on their Earth than ours. He repeats the history we saw in the beginning in flashbacks before saying he was sentenced to a mental institution after he was convicted. He was even given electroshock therapy. He was having such therapy the night the particle accelerator exploded, which resulted in his powers and being able to escape the asylum. Then he got an idea. An awful idea. The Grinch Flash got a wonderful, *awful* idea! The team hides out in the time vault, where Wells assures them they are safe. Cisco and the Flash head back to the location they went to before. Cisco opens up the breach, and Zoom zips though. They both take off running at top speed, and the tachyon device seems to be working well. Flash leads Zoom to STAR labs where Barry laid out a distraction maze for Zoom, which is just enough to throw him off. Barry then shoots him with a trap gun. Zoom asks how Barry was able to figure out who he was. Barry says he made a mistake getting close to Caitlin and telling her who her doppelganger was. He says they would have helped him if he had just told him. Barry thinks that he has Zoom trapped, but he says you can’t lock up the darkness before breaking free of the device and zooming away. The West family returns home to find it ransacked. Zoom left a clear message for Barry in Wally’s new room: Your speed for Wally. He took him back to the cell where he originally held Barry. The man in the mask is still there, and still tapping away. Zoom tells him that the only one who can save him is the Flash. The team is spinning off ideas, but there’s faults in every one of them. Joe silences the room and leaves, needing a minute to process what just happened. Barry goes after him. Joe doesn’t ask Barry to give up his speed, but Barry is willing anyways. He says it’s the only way. Barry then has Cisco use his powers to get a look at Wally. He sees him alive and in the cell. Zoom is also there, and can sense him. Cisco tells him that Barry is willing to give him his speed. 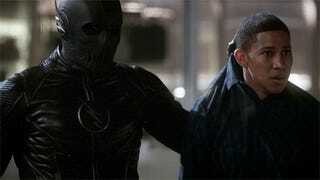 Zoom arrives with Wally at Earth-1’s STAR labs, Zoom hands him over and Cisco rushes him out. Wells preps the device necessary to transfer the speedforce, and the rest of the team just hangs out with Jay. It’s just as awkward as you would think. Cisco asks how he was able to be in two places at once. Jay says it was a Time Remnant, a version of himself he pulled from his own timeline. When Barry asks who the man in the mask is though, he says he wouldn’t believe him anyways. With the preparations finished, Barry gets on the speed treadmill and starts running. Eventually he speed drops, as the speedforce leaves his body. Jay then injects it into himself and goes a bit mad with the power. Jay slams Barry against the wall in a choke hold. Caitlin is the one who appeals to his humanity and asks that he lets him go. He lets Barry go and takes her instead. Keystone City is where Wally West was active as the Flash in the comics. FINALLY, they get around to exploring Cisco’s powers. Seriously, if I was him I would’ve done that the second I returned from Earth-2. The concept of the electric chair giving speed force powers instead of lightning was explored briefly in Flashpoint, so that was interesting. That’s what you get for underestimating Caitlin dude. I think the odds of Wally becoming a speedster by the finale are going up. The parallels between Jay and Berry were odd. On the surface, sure they both lost their mothers, but the circumstances were very different, so Zoom saying that Barry could’ve turned out like him was a bit jarring.